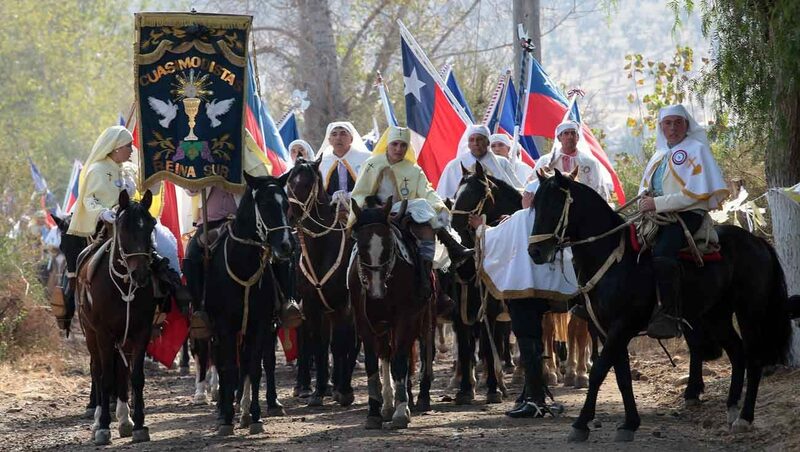 COLINA, Chile (CNS) — The priests and helpers came on horses and bicycles carrying red, white and blue Chilean flags and metal crosses. Their mission: to pray and give Communion to the old and infirm, parishioners who could not get to church on Easter Sunday. In Chile, it is known as “La Fiesta de Cuasimodo” (Quasimodo’s Festival), and it takes place every year on the Sunday after Easter, Divine Mercy Sunday. This year on April 23, Santiago Cardinal Ricardo Ezzati and 4,000 other helpers went to the foothills of the Andes, to the city of Colina, about 20 miles north of Santiago, to help the elderly and sick. They visited about 100 households. The volunteers are known as Quasimodists, and they come from different parts of the community. Whatever the origin, the time-honored festival brings joy and peace to many parishioners. One of them, 76-year-old Orfelina Contreras, suffers from osteoarthritis, a disease that makes it impossible for her to attend Mass. “I cannot move to go to church, so the priests brings me Communion every 15 days. But, the Quasimodo is different from the other Communion I receive during the rest of the year. It is something very beautiful and special. I love it because my family is reunited through this festival. For me, it is a tradition dating back years. “It was so beautiful to see the cardinal here with us,” she added. The tradition is thought to date back to colonial times, when the Spanish ruled Chile. In those days, bandits would attack the priests to get their silver chalices, so cowboys known as “huasos” would guard the church officials. The priests and their bodyguards were given food and drink along the way, usually “chicha” (corn beer) or wine, and that tradition continues to this day. Early in the morning, hundreds of modern-day huasos arrived at Colina on horseback in traditional cowboy clothes. They wore black leather riding chaps to protect their legs, black boots, spurs, grey trousers, cotton shirts and a white cape. The cape has Chile’s coat of arms on it and symbols of the Eucharist. Out of respect for the church, the huasos did not wear their traditional cowboy hats, but instead covered their heads with a white cloth. For many of them, the tradition is passed down for generations, and they have been coming to the festival since they were little boys. These days, the festival continues to be celebrated mainly in the Santiago area. It is also known locally as “correr a Cristo,” or run to Christ. Speaking to Catholics in Colina, Cardinal Ezzati said he was very pleased to see the thousands of Quasimodists who accompanied the procession. “It is a joy to live Quasimodo in Colina and to participate in the faith of the people of this sector. They show an essential dimension of the Christian faith, which is the real presence of Jesus Christ in the Eucharist and a Eucharist that is a gift for the sick,” the cardinal said. He also stressed the importance of assisting the most helpless, who cannot leave their homes to receive Communion: “This expression of faith reminds us that the life of a country cannot be built with hope outside the firm rock that is the Gospel of the Lord. It is impressive to see the faith that is transmitted from the grandparents, to the children and the grandchildren, who continue carrying this testimony of faith in the countryside and in the city,” he said. In each house that the Quasimodists visited, there was a small altar, where the archbishop prayed with the family, gave Communion and spoke to those suffering at home.